A very common (and noisy) sight throughout South Dakota in the summer. Killdeer are known for their loud kill-deeeeer cry and for the adults' famed "crippled bird" behavior in trying to lure predators away from their nest by feigning injury. 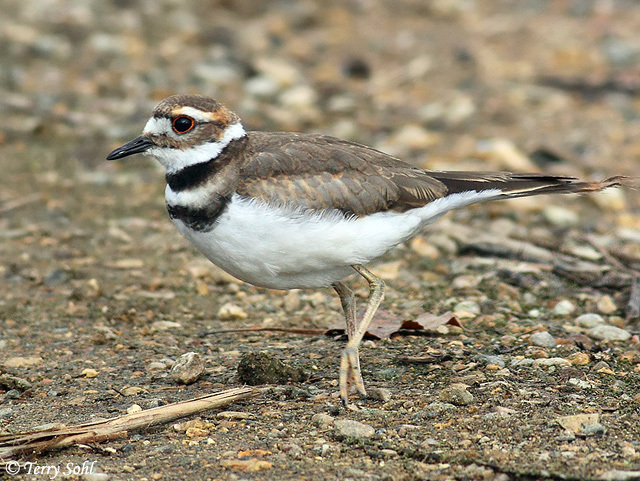 Killdeer have become very accustomed to a human presence, even nesting in suburban areas. Habitat: Open ground such as pastures, fields, large lawns, shores, river banks, and mudflats. Diet: Mostly insects, also earthworms, snails, and crayfish. Nesting: May through June in South Dakota. The nest is usually just a simple scraped area on a gravel or sandy area, with bits of rock and vegetation sometimes added after the eggs are laid. Between three and six eggs are laid, with an incubation period of 23 to 27 days. Both parents help to incubate the eggs. 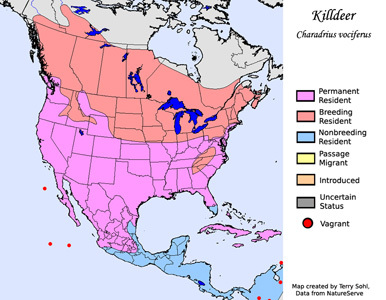 Migration: Killdeer in the Northern U.S. and Canada migrate to the southern U.S. and Mexico. Southern populations are semi-permanent. Similar Species: Semipalmated Plover is probably the most likely to be confused with a Killdeer, given the similar plumage pattern. Size differences are obvious, however, as is the trademark call of the Killdeer. Conservation Status: Widespread and common, and becoming well adapted to living in a human presence. Nesting often occurs in and around suburban settings now, with birds even adapting to nest on a rock roof or in suburban rock landscaping. Additional Photos: Click on the image chips or text links below for additional, higher-resolution Killdeer photos.